Review of the Orthofeet Stretchable Mary Jane. 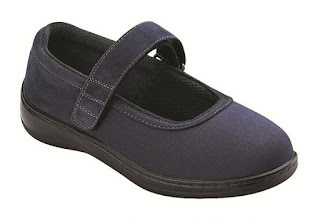 The Orthofeet Stretchable Mary Jane is a wonderfully comfortable shoe for women who suffer from painful bunions, hammertoes, corns and toenails. This shoe has a thick rigid sole that limits motion across the bottom of the foot, which allows for more comfort. It’s also lightand comes with an excellent insole that provides cushion and arch support for more biomechanical control of the foot and ankle, which translate into less knee, hip and lower back pain! The insole can be removed so that you can replace it with your custom-molded orthotic if needed. What sets this shoe apart from others is the Spandex toe box, which decreases pressure on tender toes. This shoe is considered an ‘Extra-Depth’ shoe, which means that it has extra room for the toes. Many people aren’t aware that Medicare approves this type of shoe for most patients who suffer with diabetes with the added complications of diabetic neuropathy and/or peripheral arterial disease. Medicare has a wonderful program that pays for diabetic patients to receive one pair of extra-depth shoes with three sets of custom inserts (each lasting four months) each calendar year. Medicare provides this program for their diabetic patients because research has shown that if they get diabetic patients into proper shoes and inserts, Medicare saves billions of dollars in hospital bills resulting from diabetic ulcers, infections, and amputations. This is one of many styles of shoes that the Medicare program covers. If you aren’t diabetic, these shoes can be purchased from Footsmart.com and, if you are diabetic, many Podiatrists offer the extra depth shoe program through their offices. I recommend that if you are diabetic, make an appointment with your local Podiatrist for your annual diabetic exam and, he or she will determine if you are medically eligible for the program. If your Podiatrist doesn’t offer the program through his or her office, you can request a prescription to send you out to a facility that does offer the program. We’ve offered this program to our patients for over a decade and the patients love the shoes and inserts for the comfort and I love it because it decreases diabetic related complications! Remember, if you are suffering with painful feet, I recommend that you follow up with your local Podiatrist for evaluation and treatment. There are many non-painful, non-surgical options that can significantly decrease your foot pain. As an added benefit, I also love the fact that Orthofeet shoes are made in America!